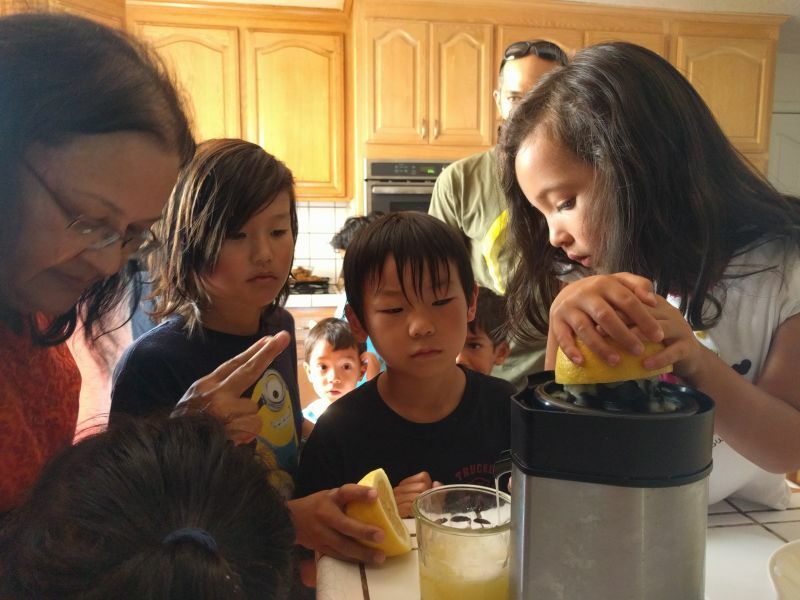 The Third Awakin Kids and Parents Circle ushered us into peak summer with joy and stillness. Harshida aunty invited each child to ring the gong and then as a group, we listened intently to the last reverberations. Not a child spoke, there was total silence in the space. I am continually amazed to see how well this has worked as an introduction to meditation for the young ones. As usual, we swayed to Nimo's song and the parents transitioned into their circle, while the children cooled down in the heat with water balloons and water fun! Here is Sriram helping with the water balloons. In the parents' circle, we had several reflections. I reflected on a time of blessings, having just had a son. The event of birth is such a special time -- it brings forth blessings from far and wide, from people I haven't heard from in years. The question for the circle was, "What blessings are we counting?" For me, parenting has brought many blessings -- one that I like a lot is the explicit presence of humor. On July 4, my father explained to our 5-year old daughter the significance of Independence Day and its connection to freedom. She absorbed it and used it on me the next day when she complained bitterly, "I could only get one dress the whole day -- it was independence day and I still didn't get any freedom!" Children bring humor into our lives in all sorts of wonderful ways. Radha felt that a huge blessing of parenting is that it creates circumstances for our own growth. Parenting often brings friction into our lives when our children find themselves in conflict with us. At such times, Radha offered some sage advice that has guided her, "Be the road on which your child travels." Creating safety for our children and letting them be who they want to be has been her guiding principle. Linda shared the blessing of meeting her husband (awesome Pete who is part of the awesome tech team of ServiceSpace) through the ecosystem. She shared another blessing - the story of her daughter chasing a butterfly. She was worried about what would happen when the butterfly would fly away -- would her daughter be sad? She resolved that her daughter would deal with that. When that moment arrived and the butterfly flew away, her daughter spontaneously said, "Bye bye butterfly!" without any attachment. Shwetha shared about her daughter who has just become 2. She shared the challenges of potty training -- the skillset of potty training is something we haven't really thought about prior to becoming a parent. 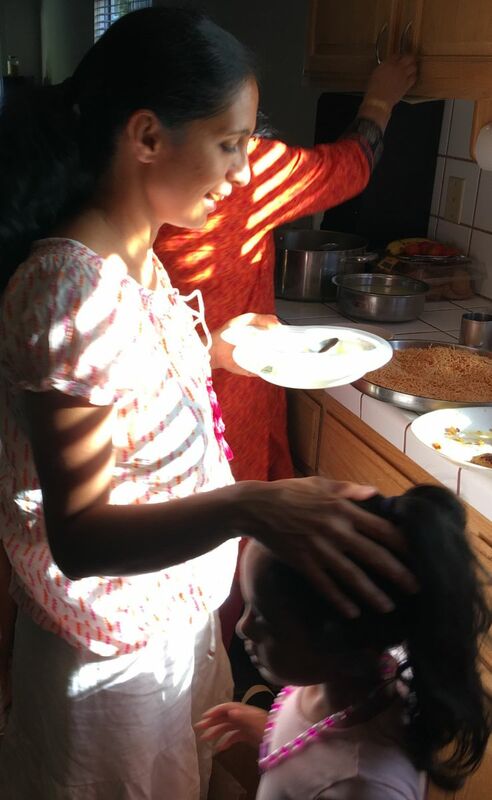 Shwetha shared the blessing of having her partner, Sri, and not having to do this entirely on her own. Kristin shared about how it fills her up to see her two children sleeping at night in their beds. 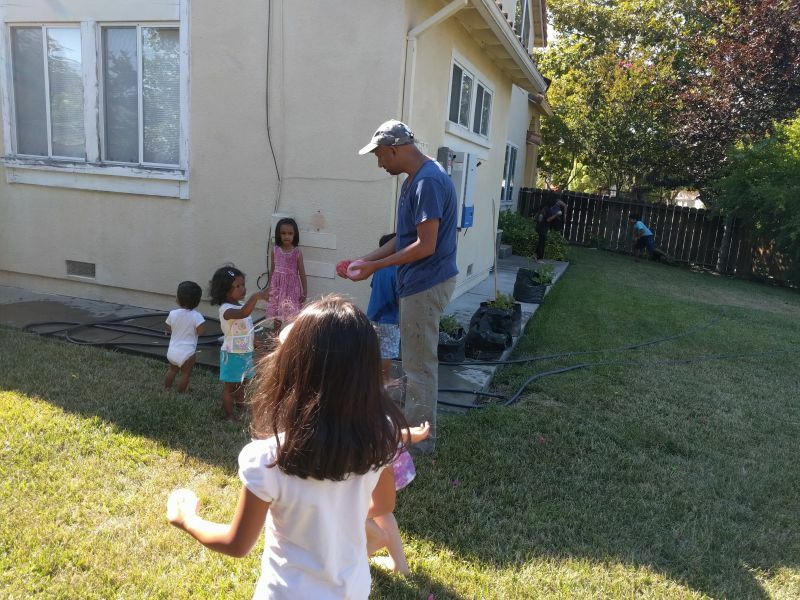 John shared his joy of witnessing the fun the children were having outside with water (he took the outdoor pics). A memorable quote from John, "Each child is a looong once in a lifetime thing." Kozo echoed the blessings of hearing the wonder and joy of our children. He also echoed the challenge of conflict with children. As Kozo's strength is returning both from an illness and father fatigue (now that's a great term for the rest of us to pickup), he reflected on the challenge of channeling that energy into a compassionate and nurturing direction, and not use it to discipline children. Kozo received this challenge as a blessing. Prakash reflected on the power of the children in the circle -- when he asked Dinesh uncle and Harshida aunty to share how the previous circles were, he noted that their faces just lit up. Prakash shared the blessing of his daughter in this way, "She makes everything in me become better," and that also includes his tennis skills. 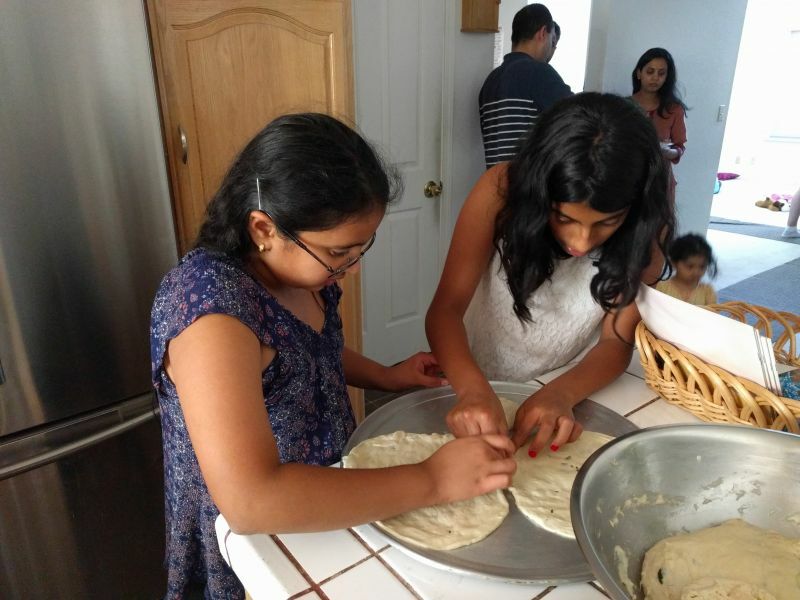 Shruti shared the blessing of learning how simple things can be enjoyable. Their daughter enjoys sitting on the floor and separating out fruits. Even on trips, in the car, she requests, "When we get home, can we sit down and separate the fruits?" She interacts with animals and all the people she meets. She waves at everyone at the crossings. She requests her mother for yogurt and sugar. Shruti reflects, "She is only looking for simple things in life -- not Disneyland, not something big." This is a huge blessing for her. Neerav echoed Shruti's thoughts and shared about the wonder of his son's discovery of an acorn on the second day of his preschool. He also shared the edge of teaching about sharing when faced with aggressive behavior. His sons enjoy sharing their toys in the playground, but sometimes, somebody comes up and takes their toys. They are trying to find a balance between when to share and when to not share. Neerav noted, "I am fine with saying it's ok not to share," but the hard part is knowing when to say it. Trishna shared discovering that she had time to herself in a few years as her children had both transitioned to school. Flooded with thoughts of what to do in this time, she reflected on offering her attention to creating a space to embrace this transition mindfully. Kajal shared about their almost 2-year old daughter, noting how much children are in their present, not holding any grudges. She noted a little conflict where her daughter wants to wear her slippers in bed. When Kajal said "No," her daughter would be upset and then run around in circles. With her anger spent, she'd be totally free of it and not hold any grudges. 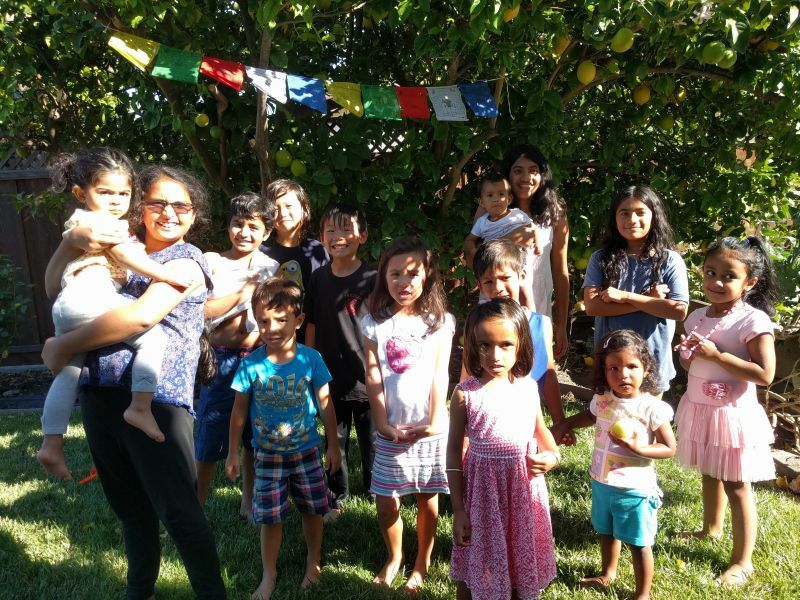 Darshan shared about her older kids (10 and 13-year old) -- she shared being frustrated about not being able to make lunch. Her children helped her make and serve lunch. She noted that more than the activity, the shared feeling of joy during the process of working together really touched her. Anish shared that his blessing was being able to sit in this circle -- he never gets this kind of time. He also shared the excitement of his kids wanting to make lemonade with Harshida aunty -- that is a blessing. Ram shared how special it was to see the kids sitting around Harshida aunty. 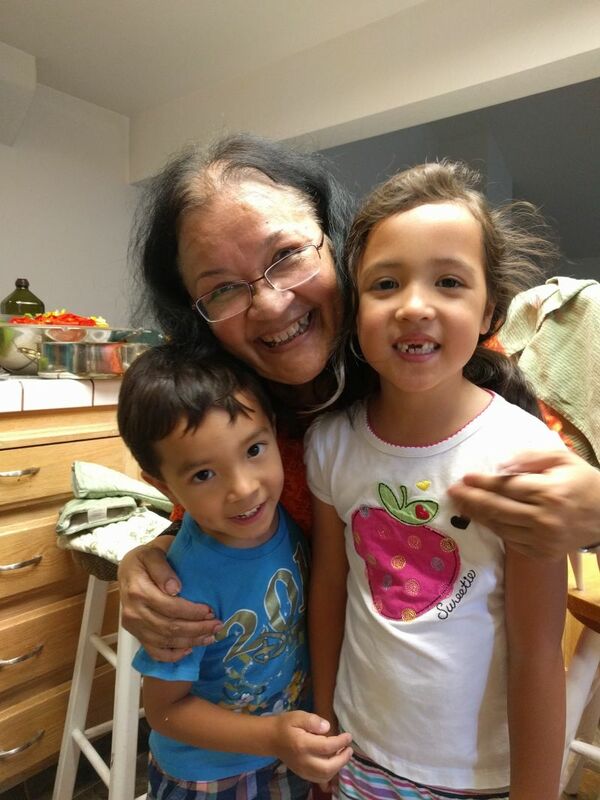 "It was magical to see all the kids sitting quietly around aunty." He shared an observation -- from the time his daughter was born, he felt pressured from "experts" for all kinds of things, from latching to rolling to sitting -- the milestones which felt formulaic. In every phase, he felt that his daughter needed to catch up. The lesson for him is that it's their job to put in the right effort, but they should not worry about the outcome. He finds this to be meditation in practice. It is the anxiety within ourselves that is causing all the trouble. My father shared the blessing of seeing all three generations in the circle and echoed gratitude to Dinesh uncle and Harshida aunty for holding the space for us. He reflected on the purity of children and how, even after a lot of work meeting their storytelling "demands," he feels energized because of their purity. Lalita appreciated the shares on the struggles we face. It is really challenging to be a parent these days -- we have information coming from all angles and sometimes it is overwhelming. Our parents didn't have the internet, and they relied on the community and elders. She felt the space here was a blessing as someone would take care if her daughter cried. Dinesh uncle shared his joy of seeing all the children jumping up and down. "My hope is that collectively with every parent's effort put in, the kids will have an experience of love from several parents as a community rather than just their own parents. It will also give us the opportunity as parents to open up and love other children as if they are our own." He also invited us to consider their home as our home for the period of these meetings. Sriram shared how the wonderment in his daughter renews and refreshes him. It is a blessing to see the beauty of wonder in everyday life that we as adults sometimes forget. He also shared becoming aware of how we as parents push preconditions onto our children. Another edge for him is to strike a balance in what traditions to uphold and what to change. As we all work on our edges as parents, it is great to be in circle where we can strengthen ourselves in authenticity and strengthen each other with love. The subtle micro-opportunities of awareness are all around us. I noticed Harshida aunty interacting with a little one who lined up with her friend for a delicious goody. The next thing that happened was this little one offered her plate to her friend, and then someone else offered her a plate. Anonymous gifts of toys were also offered by parents to other parents so that our children can learn to gift while also keeping toys in circulation instead of gathering dust. At the end of it all, Harshida aunty wrote to us, "Both Dinesh and I feel so grateful to all of you who filled space with your presence and considered our humble home and kitchen as your home and volunteered in ways I cannot even list here. Thank you to each one of you who drove from far and near and took the time out of weekend. Pretty much each kid, who could express, :) asked about coming back soon. 'Auntie, when is the next time we can meet?' 'Auntie, can we meet next week?' 'Auntie, can we only come once a month?' To them and to all of you, although circle will be once a month; all of you are welcome to our home at any time. Kids (and parents) considering this home as their home will be our dream come true." On our drive back, my father shared, "This home feels like an ashram. The work happening here is wonderful." I know he isn't the only one who feels that way :). It was truly amazing to see Harshida aunty holding space for these children. There was so much going on but she was able to be present with each child. She knew exactly whose pizza was ready. Customized lemonade to fulfil pink lemonade request. She effortlessly weaved bonds between the kids and parents. She was so genuinely, keenly listening to my son's outlandish request for next Awakin circle! It just took my breath away. What a shining lesson in how to be present with kids!! My kids shrimayi and shiva were so enamoured by her love. They just couldn't stop talking about how loving she is. Yes Somik. This house is an Ashram of love, kindness,mirth of joy.